Portsmouth Harbor Lighthouse (also known as Fort Point Lighthouse, New Castle Lighthouse and Fort Constitution Lighthouse) was first established in June 1771, making it the first light station north of Boston in the American colonies. Today’s 48-foot tower was built in 1878. In early 2000 the American Lighthouse Foundation was issued a license to care for the lighthouse. A chapter of the foundation, the Friends of Portsmouth Harbor Lighthouse, was founded to care for the lighthouse, the oil house, and the wooden walkway. Status: Active aid to navigation owned by the U.S. Coast Guard and licensed to the American Lighthouse Foundation. 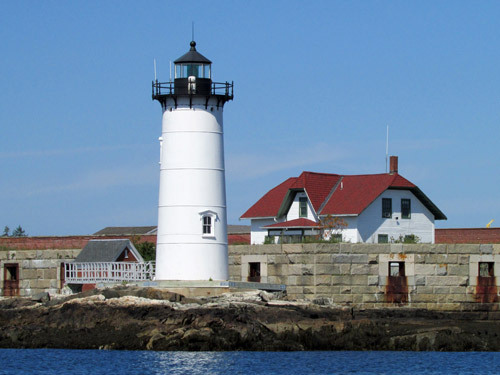 The Friends of Portsmouth Harbor Lighthouse – a chapter of the American Lighthouse Foundation, is dedicated to restoring the historic lighthouse. The first lighthouse established at Portsmouth Harbor Light Station was completed in July 1771. The structure was described as a shingled wooden lighthouse with a cooper-roofed lantern. The American Revolution had a major impact on the light, especially given the fact that the beacon was built adjacent to Fort William and Mary, later named Fort Constitution after the war. During the period between 1774-1784, the tower was darkened. By the turn of the century, a new lighthouse was deemed necessary at the station, prompting the federal government to erect an 80-foot octagonal wooden sentinel in 1804. The new site for the lighthouse was situated 100 yards east of the original beacon. The height of the second structure was an object of discussion by engineer I.W.P. Lewis in 1842 when he suggested that the lighthouse could be shortened 30 feet due to the establishment of the nearby Whaleback Light Station. Eventually, the Lighthouse Service heeded Lewis’s recommendation and shortened the tower to 55 feet in height. Portsmouth Harbor Lighthouse received a fourth order Fresnel lens in 1854. By the year 1878, the light station received its third lighthouse – a cast-iron tower 48 feet in height. Up until 1902, the structure was painted reddish-brown in color, before donning the color white. The last keepers of the light left the station in 1948. The American Lighthouse Foundation and its chapter – the Friends of Portsmouth Harbor Lighthouse, assumed stewardship of the lighthouse in 2000 through a license with the U.S. Coast Guard.